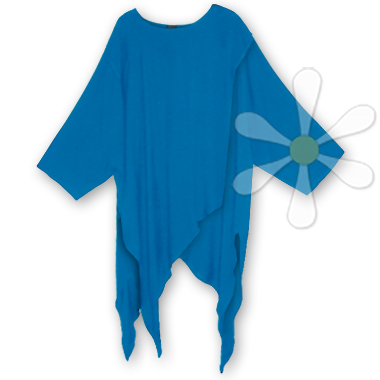 Distinctive style and comfort meet in this peerless tunic! The shape is pure magic with its long pointed hemline, originally designed by Laise Adzer and made exclusively in Morocco. The bodice is constructed from two overlapping layers that fall away in front and in the back in fluid long streamers. The way it drapes and flutters, it's the dreamiest layer ever! It's equally fabulous cinched with a yummy susti scarf or a genuine Moroccan leather belt, or simply draped dreamily over your yummy curves. Express your oneness every day -- if you body is unconstrained the rest will follow...!